How to enable colorization and how to customize with different colors, colorize certain programs or apps, and more. Enable it in your profile. To colorize text within log messages, generate messages containing ANSI escape codes. Papertrail will colorize them as shown in More colorful logging with ANSI color codes. Papertrail colorizes normal foreground colors, which are ANSI 30 to 37 (see this table for a visual example). Codes in either direction (ex: behaviors, lighter variants) are not supported and may not render properly. Papertrail honors ANSI color codes regardless of user-specific colorization preferences. Even though color codes aren’t visible, they can still affect search results. In particular, it’s not possible to search for a phrase that crosses a color boundary. In the screenshot above, a query for "Task Load (2.5ms)" would match, but "(2.5ms) SELECT" would not. If you need to filter colorized logs, check out the example regex. You can also customize almost any aspect of the log viewer. Read on for how to colorize a specific program or system, change text size, or use completely custom colors and options. 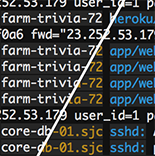 Colorization for the papertrail command-line app is part of the papertrail-cli README. Our goal is always to expose the right level of customization and in the correct form, and not just create options for the sake of creating options. A more complex product, or even a more sophisticated one, is not always a better one. With colorization, there’s a slippery slope between a bit of color to add contrast and enhance readability, and an end-to-end custom theme markup. Those aren’t likely to let you do more with your logs, especially compared to other ways which that time (ours and yours) could be invested. However, you might have different design taste than we do, have a specific vision in mind, or just want to tinker. If you already use a browser extension to customize site design or behavior, the customization examples below offer some ideas. Note the *= instead of = to match substrings within the system name, rather than = for exact match. These are standard CSS attribute selectors. Any selector can be used. The same technique can be applied to the data-message attribute instead of the data-system attribute. This will colorize any messages containing “OMG” dark red. The log message has four CSS elements: timestamp, system name, program name, and message text. Override any or all of them. We don’t change these tags often, so they are reliable for use in your CSS. If you create CSS that others might use, or you have comments or requests, please tell us more. Thanks to Sam Stokes, Rapportive, Luke Carpenter, and Ghostworks for major contributions to this. Y’all rock.